I don’t know about you, but I seem to have a hard time finding wall art that I really like. So, over the last few months I’ve been making wall art that is meaningful to our family. Soon I’ll be sharing tutorials for the several types of wall art I’ve made. 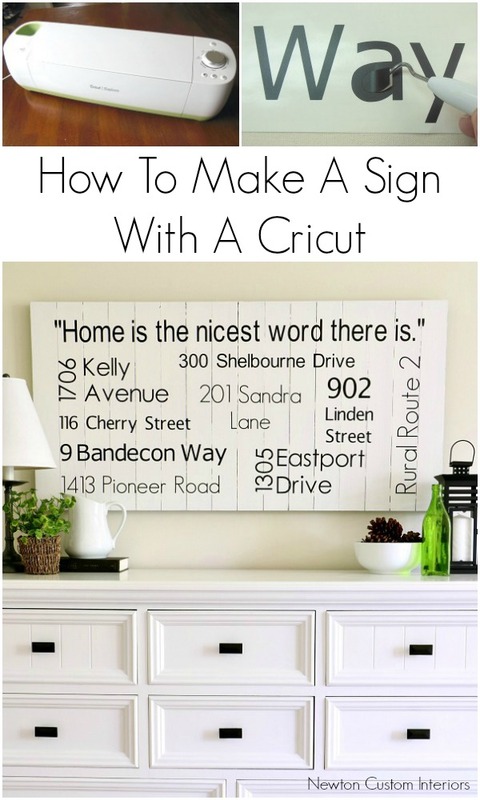 Today, I’m starting with one of my favorite wall art projects, I’ll be showing you how to make a DIY sign with a Cricut. My inspiration for this project came from a blog post I read a few years ago. 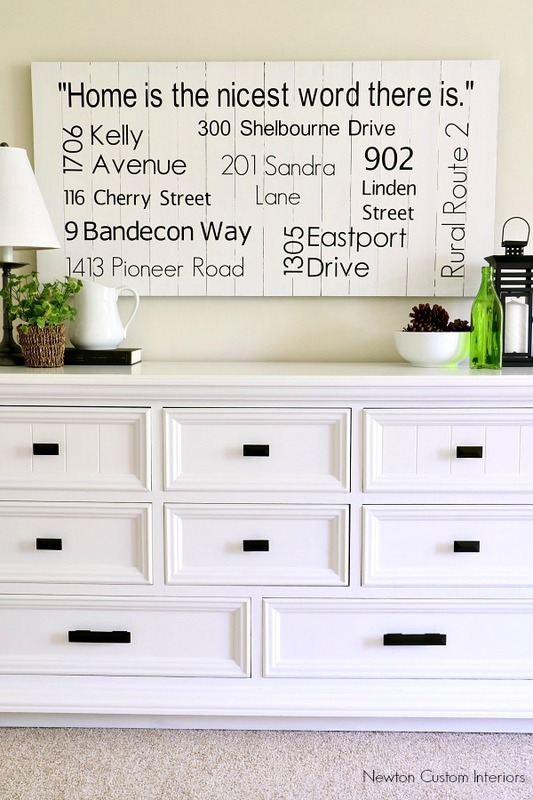 Shelley from House Of Smiths made a cute sign that had some of the addresses where they had lived on it. 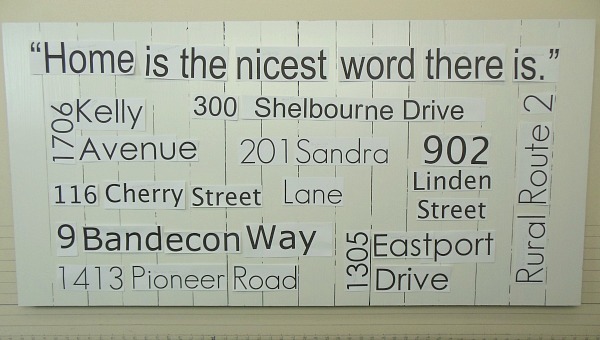 Our sign is made a little differently than hers, but it does have all of the addresses where we have lived over the last 34 years. It also includes the address where we each grew up (Rural Route 2) and the apartment building where we met in college. 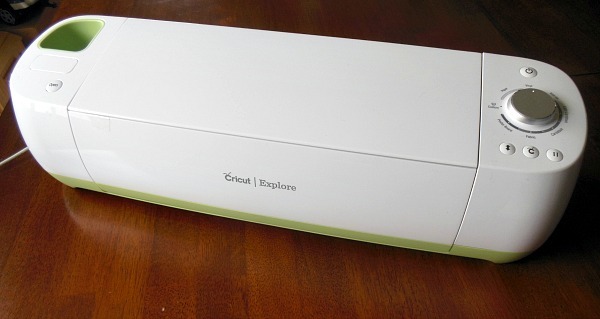 So, many of you are probably wondering – what is a Cricut? It’s a cutting machine for DIY crafts and projects. I don’t have one, but my crafty next door neighbor does! She very graciously helped me with this project. 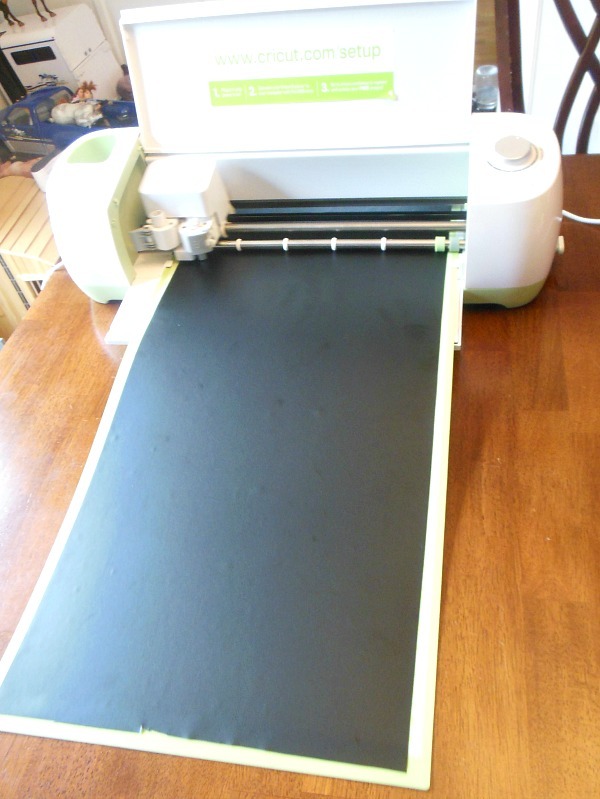 (Silhouette is another popular cutting machine for crafters.) The Cricut made cutting out all of the vinyl letters and numbers so easy! I could use several different fonts and sizes of fonts using their design program. Cut the board to the size needed for your sign. 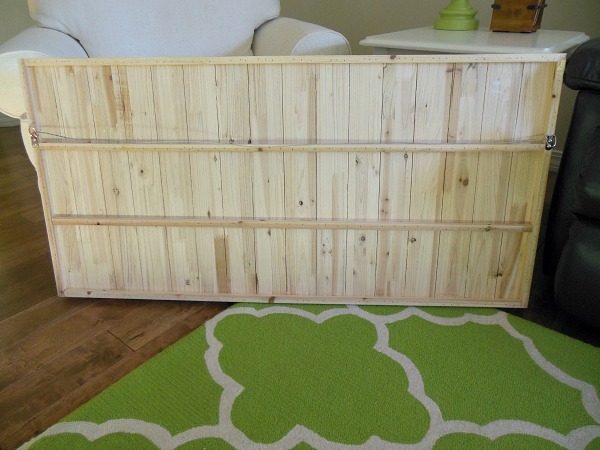 Or you can build a wooden slat sign. This tutorial does not include building the wooden slat sign. I bought a wooden slat sign on clearance at Pier One a couple of years ago. I didn’t like what was painted on the sign, but I knew I could paint over the design and create a new design. This is what it looked like, front and back. Paint your board or sign. I painted mine white and painted the sides black. 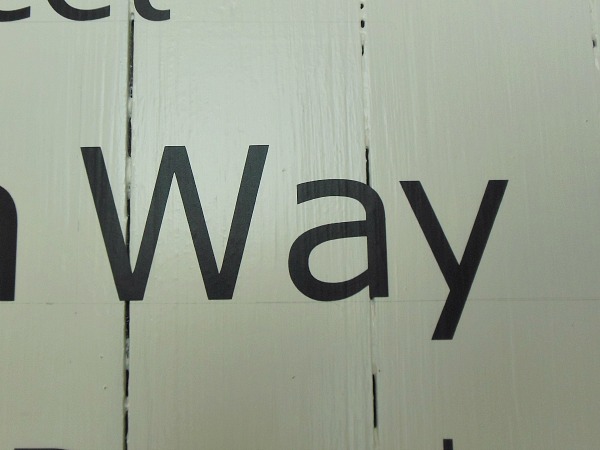 Apply a couple of coats of the Polycrylic to the painted sign. It helps the vinyl letters to stick better. I’m a very visual person, so I needed to be able to see what my sign would look like with the different fonts. So, to help me figure out what fonts and font sizes to use, I printed out all of the words and numbers in Microsoft Word. Then I cut them out and arranged them on my sign. I used the Cricut design program on their site to set up all of the words and numbers in my sign. 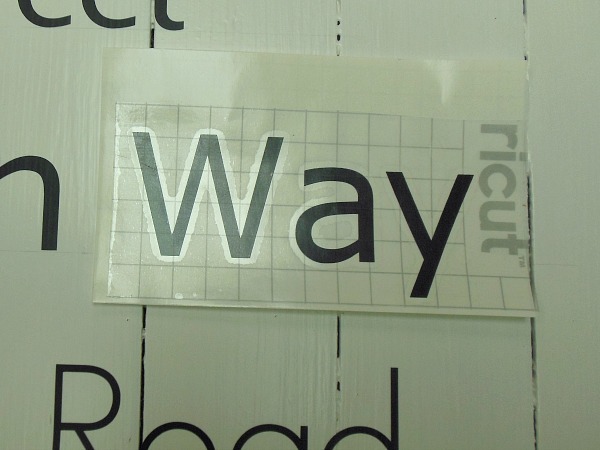 Then we set up the Cricut with the black adhesive vinyl and had it cut out all of the letters and numbers using the Cricut design program. The numbers and words will be on a big sheet. Cut out each of the words and numbers. 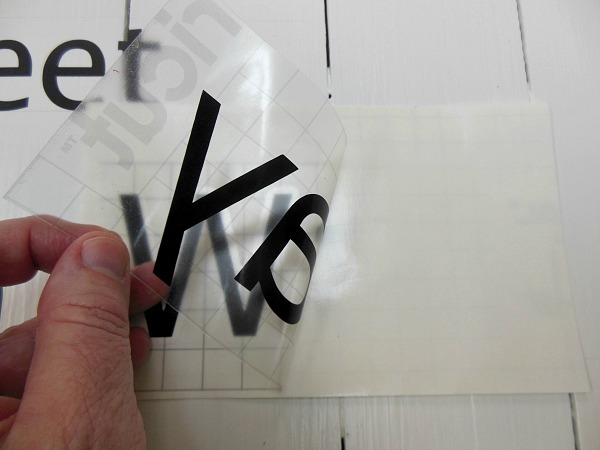 Take off the background vinyl, leaving the word or number. 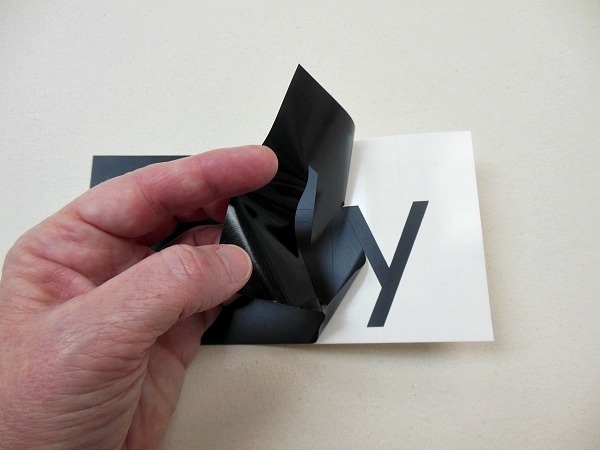 Apply the transfer tape to the vinyl word. I cut out the transfer tape to be about the same size or a little smaller than my vinyl words and numbers. 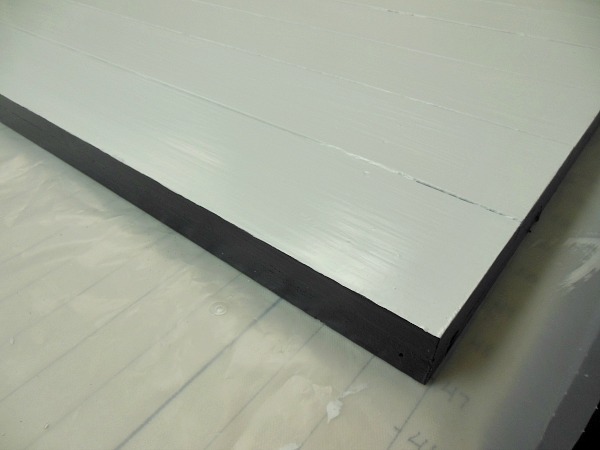 In this picture the transfer tape in the clear coating with the squares. Take the vinyl backing off. 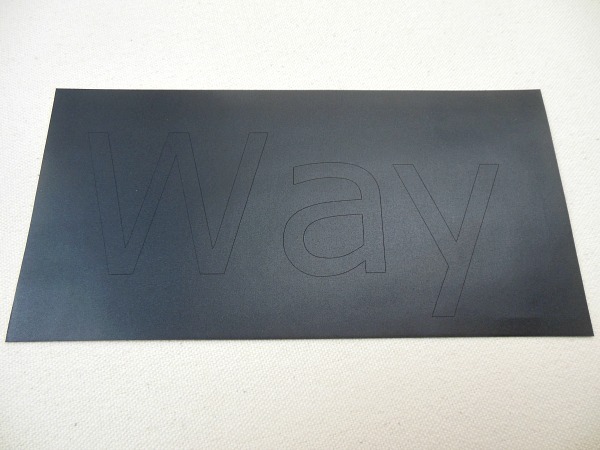 The word or number will be stuck to the transfer tape. 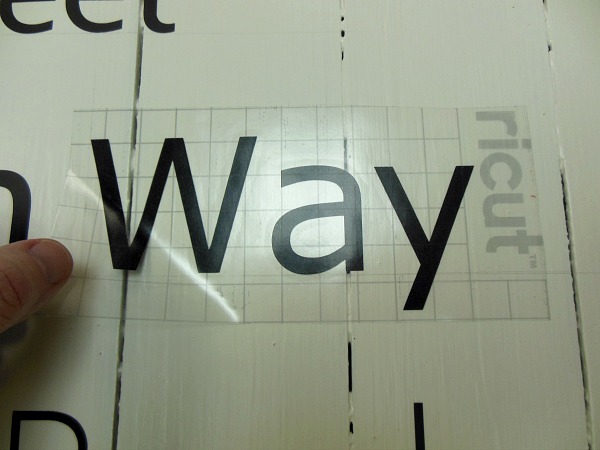 Apply the transfer tape and word to the board in the position that you want it. I used a yardstick and pencil to mark a straight line for the words. Rub the vinyl word or number to transfer it to the board. 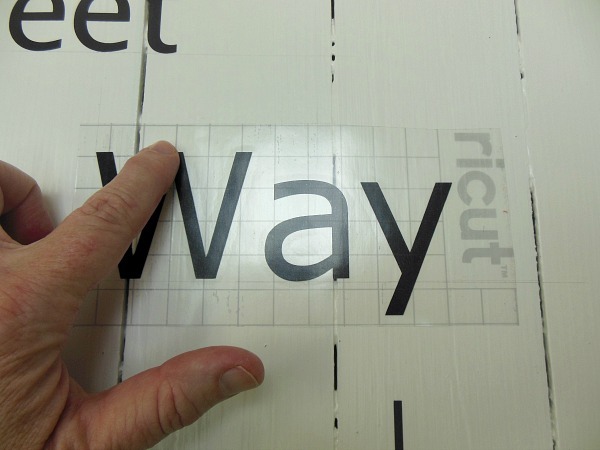 Then peel off the transfer tape, and the word should stay on the board. Erase the pencil lines. Continue with all of the words and numbers for your sign. I found that it helped to start in the center of the sign and work out to each edge. I’m so thrilled with how our sign turned out. It’s now hanging in our entry, and it’s become quite a conversation piece when people come in the front door! I love that it tells a little of our history. 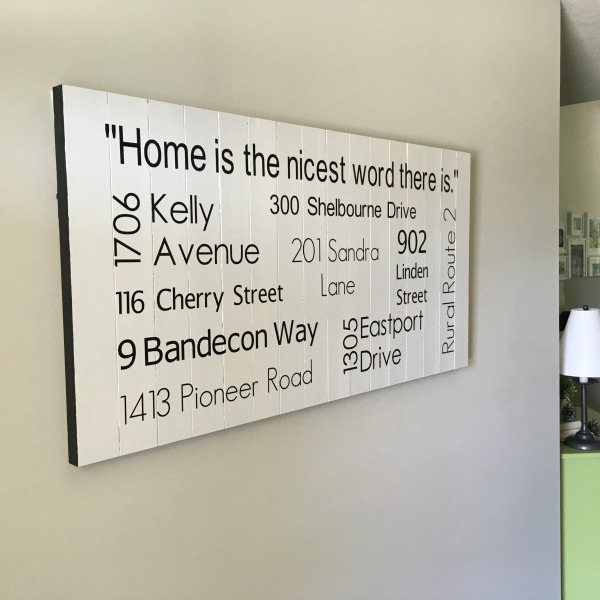 You can make any design you would like for your sign. Instead of addresses, maybe you could use birthdays and anniversary dates. The sky’s the limit for what you could create! I hope you’ve enjoyed this how to make a DIY sign tutorial! I LOVE your address sign. I just had an idea—-how about a sign for men’s den/man cave with all the cars they have owned?! Thanks Jeanette! That’s a great idea! Will you send out a calendars like last year? Karen, I don’t think I’ll be doing calendars this year. I love your sign, and would love to start making my own. 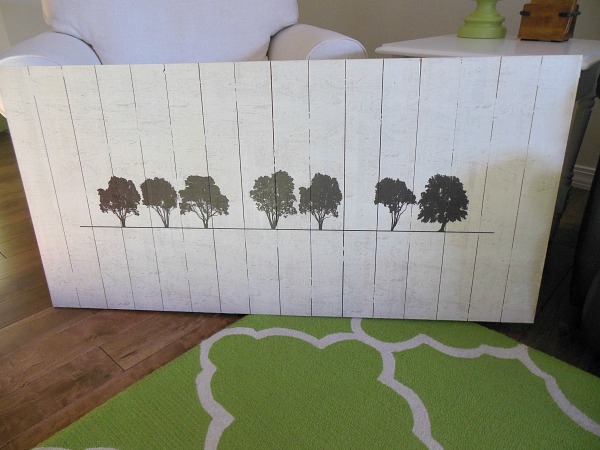 Looks so much easier then stenciling, plus stencils are expensive. So I’ve recently been thinking of buying a cricut or a silhouette cameo, but I don’t really know anything about them so I’m not sure which one to buy. Thanks Linda! I’m only familiar with the Cricut. I believe there are good blog posts about each type of machine. I so want one of these machines! 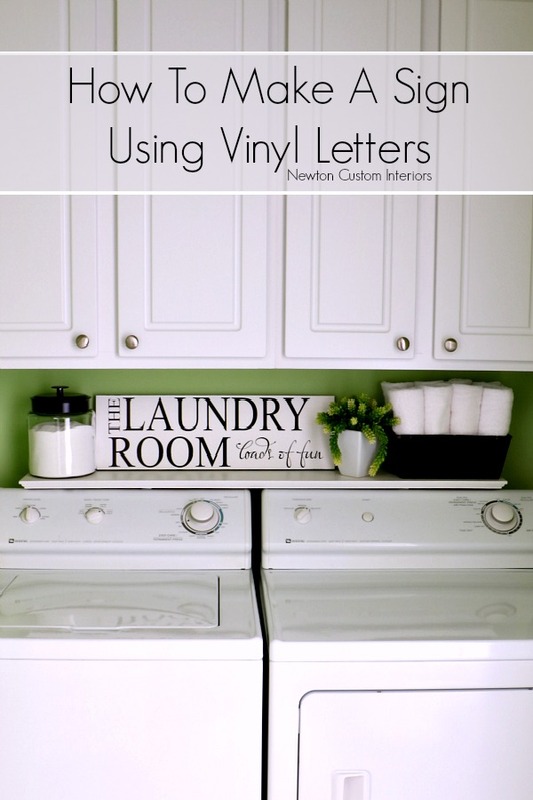 They make the coolest lettering, and I love this project!